So today is the big day that Bassanova gets to be on TV. Before our debut, I stopped by Ranchu to say wassup to my dreaded friend. Oddly enough, I tasted clam in the soup. But when I asked him about it he told me that he doesn't use any clams. Apparently when you boil niboshi for a long time it starts to taste like clam. Who knew?! Action! My friend Mihoko was kind enough to invite us over to her place for a viewing party. Thanks Mihoko! Damn, that looks good! 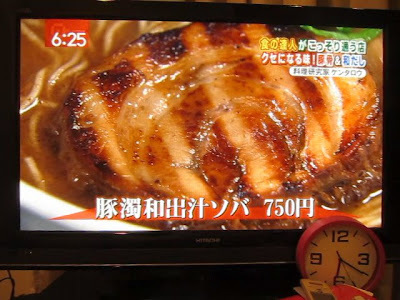 Kentarou claims that when he gets a ramen craving, Bassanova is the only place he goes. Nice! My arm!!! Haha. Initially, they were gonna feature a segment on me and my dream (no joke! the director spent an hour interviewing me and having me say lines into the camera), but then they just couldn't find a way to fit me into program. No worries, my arm was shown at least three times. I think Ebisu will become our new hangout. After a few drinks we walked across the way to Chuukasoba Kiwa. The master remembered me and was so excited that I came back he gave us a free beer. And not just any beer. This was some premium ish. Then he looks straight at Tak and says: "You look just like Abe Hiroshi." The ramen was great, but I still think it could be stronger.